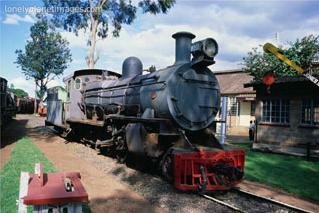 In this brief Nairobi travel guide, you’ll find some basic information about travel to Nairobi. Also look at the set of 20 articles found on the introduction page about Nairobi at this site. There are many hotels to choose from in Nairobi, from those offering bare-bones rooms to high-class luxury resorts, and none of them is ever fully booked. Major chains such as Hilton and the Holiday Inn have hotels in Nairobi, if you are looking for a familiar name. The Safari Park Hotel a full resort in itself, with large gardens, a casino and stage shows. Other good upmarket hotels are the Nairobi Serena and the Stanley. All upmarket hotels in Nairobi are air-conditioned, have services according to international standards and are staffed by English speaking employees. The only disadvantage is that no Nairobi hotel is really cheap. If a reasonably good hotel for a relatively low price is important to you, then try the Terminal Hotel. Except for some neighbouring countries, the only feasible way to get to Nairobi for international travelers is by air. See my pages about international air connections to Kenya (virtually all use Jomo Kenyatta International Airport) and these tips for finding cheap tickets to Nairobi. If you don’t have your own vehicle, then your options are the public bus system, matatus (privately owned minivans) and taxis. The public buses follow the same routes as matatus, and while the buses drive more safely, the matatus are a great experience. In all colors of the rainbow, battered and with loud benga or rap music, this is transport the African way. For 25 shillings (40 dollar cents! ), they’ll take you anywhere they go. People are picked up as the buss passes by. Taxis are plenty, and cost around 300 shillings (US$4) for a few miles in the city centre to 1000 shillings (US$14) for getting from and to the suburbs. The first thing you will want to see is the Nairobi National Park, which is a safari park right in the city limits. Take an afternoon to drive through the park, have a picnic or walk around the hippo pool walking trails. You'll also want to see the National Museum, the Railway Museum, Uhuru park, the Watatu art gallery, the Bomas villages and maybe even take a skate around the Solar ice rink. 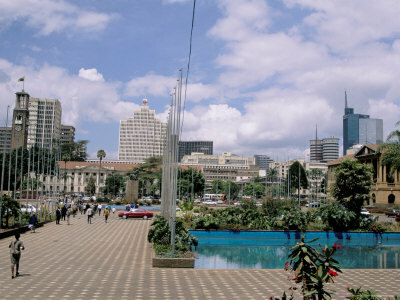 More about Nairobi tourist destinations here. Many of these sights are included in day tours that you can book through your hotel or tour operator. Dining choices in Nairobi are many and varied. Though you can find many restaurants serving familiar cuisines like Italian, Chinese, Indian, French and Thai, you should try some of the local Kenyan food as well. Kenyans are great meat eaters. Carnivore is a well-known restaurant, serving grilled meat dishes cooked on large stone fire pits. It’s very touristy, but don’t miss it. The weather in Nairobi is actually much cooler than the rest of Kenya, so you may even need to pack a jacket for the cool nights of July and August. The 2 rainy seasons are between March and May, and then again in November and December. Things to remember when packing for your trip. The official languages are English and Swahili. Most Kenyans, and all inhabitants of Nairobi, speak English well. Nairobi has a reputation for crime, but I believe this is exaggerated. If you follow some simple rules, nothing unpleasant is likely to happen to you. The major rule of thumb is to not go into deserted areas alone, and to watch out on the streets after dark (which is starting at 6-7 PM). After dark, better take taxis. Nairobi is like most other North American cities in this respect. For those who like to have plenty of information right at their fingertips while they are on vacation, I would suggest getting a good travel book to cover the area of Nairobi. Travel guide books are common, but the Lonely Planet guides have been my favourite since long. They have one for all of Kenya, and the Nairobi section is excellent.